This luxurious silver and white watch face features a cameo glass centre piece decorated with lovely off-white figures set against a gorgeous deep reddish-brown sky. The central figure is a classically draped maiden harvesting apples and other fruit with the aid of three putti. 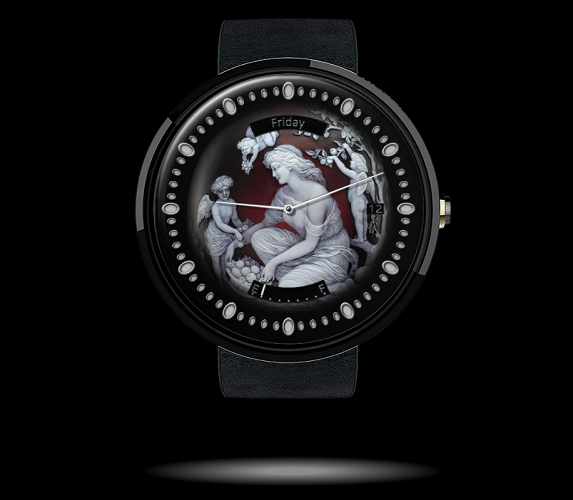 At the edges of the cameo, the day, date and battery charge are displayed in embossed sliver text deep within cut-outs in the dial. The cameo glass is from a rare antique vase crafted by Thomas Webb & Sons ( circa 1900 ). Not my style but I really like the depth it gives to the watch. Thank you very much! And, you are most welcome ... I discovered the vases a little while ago and I have been trying to think how best to use these colourful images. As you mentioned, I particularly like the depth they give the watch face; I will try a variation I think - one where the cameo extends to the edge of the dial in order to take full advantage of the "3d shading".